I have a good friend, Linda Leinen, who lives down on the Gulf Coast of Texas and writes two wonderful blogs, The Task at Hand and Lagniappe. 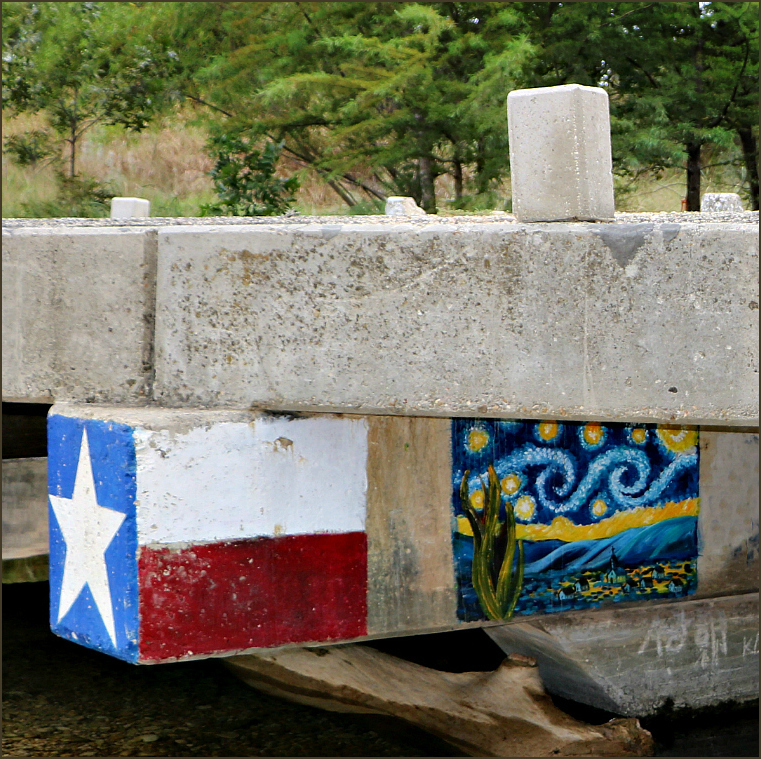 In today’s post on her Lagniappe site she write of finding a loving tribute to Vincent Van Gogh tucked beneath a bridge at the Medina River crossing on Texas State Highway 16, just a few feet above the river in a spot where only a handful of folks- swimmers, kayakers and perhaps a fisherman or two– might ever see it. She documents it’s surprising endurance from September of 2015 until November of 2017, as it has went through a number of flood events that would have seen fast running waters and all sorts of debris brushing by the painting. I love the idea of this little hidden treasure that is meant to give small dose of unexpected pleasure to unknown folks, people that the person who put it there will most likely never know. Linda also included a great video that explains the real scientific forces behind Van Gogh’s Starry Night. I ran this video several years back and enjoyed seeing it again. Take a look at Linda’s post today and see for yourself. And while you’re at it, take a good look at her site and follow her if you like what you see. I know that I always enjoy reading her work. She writes beautifully and always does a masterful job. I didn’t realize that you had posted that video. I may even have seen it and commented on it, but if I did, it faded from my mind: a good bit does, these days. Thanks for the good words! I appreciate them. It was from back in 2014 so I would be surprised if you did remember. I have sometimes written about things here only to find that I have written about the same thing only months before. Don’t you wish we could patch up those holes?! !